Potted vegetation and cut flowers comprise nearly 80 per cent of total world trade in ornamental plant varieties. Though India has a huge potential to boost floriculture through production and growth of these varieties, it has not been able to do the same for many reasons. Floriculture, or flower farming, is a subset of horticulture and is essentially concerned with development and cultivation of flowering and ornamental plants for gardens and for floristry, comprising the floral commerce. The development of new varieties via plant breeding is a major occupation of floriculturists.The flower industry comprises cultivation and trade of flowers, foliage, potted plants and bedding plants. The cut-flower trade comprises of rose, chrysanthemum, gladiolus, carnation and lilies. But the industry is undergoing a transition. While some markets are now exhibiting signs of exhaustion across the world, the others are opening up. The agricultural experts and economic literati, however, have predicted that both per capita consumption and production of the floriculture industryis likely to go up internationally. But the predictions lack an insight. Moreover, in many countries of the Third World, statistics that are available to make such projections are either not adequate or not accurate or both. India is a country where agriculture is the mainstay of our economy. But with size of farm lands diminishing generation after generation, it can be safely said that horticulture has immense potential to augmenting the income of under privileged farmers in the country. In a country with majority of medium and small farming households, intervention can help a poor farmer earn much more than what he does by making the most optimum use of available limited natural resources. India has the privilege of having diverse and adequately favourable climatic conditions for floriculture and very cheap labour for growing these crops.The greatest advantage is that flowers need much less land and water for production, when compared to cultivation of rice and wheat. Floral crops also ensure decent prices almost round the year and the lock-in period from sowing to harvesting is much less as in the case of other routine crops. Also, the net profit against the actual investment is much higher from these,when weighed against conventional crops. These products are in high demand not only in domestic markets, but also in international markets. However, we cannot deny that floriculture in the country is still at a fledgling stage. There are resource constraints and a severe shortage of skilled persons to develop the industry to match up to the existing international standards. The need of the hours to generate skilled personnel and explore sustainable means to ensure the endurance of our small and marginal farmers and survey marketing prospects to save our economy as well as increases export. Also, the lobby of the naysayers and conservationists needs to be conveniently ignored. It is time to take the plunge to reap the benefits of growing markets for floriculture. After all, nothing ventured is nothing gained! Apart from flower, the main crop, the value-added products from contemporary floricultural crops–like essential oil of rose, tuberose, jasmine, tiger lily and the varied plants extracts extensively used in medicines and the pharmaceutical industry–are exclusive and likely to face much less competition in the international market after the World Trade Organization scenario. The TRIPS (Trade Related Aspects of IPRs) agreement helps a nation secure the sovereign rights to these products. Many parts of northern and southern India, for instance the Nilgiris, have very rich flora and germplasm that has still not exploited to its maximum potential. The marketing of cut flowers is unorganised. In so many cases, the markets don’t even exist. The linkages from farms to markets are abysmal. The support from the state for floriculturists is absent. In most cities, with huge market potential, flowers are brought to wholesales markets, which mostly operate in vast open markets with inadequate facilities and pathetic environs. Cut flowers are perishable produce, the infrastructure to sustain the smooth functioning and development of the floriculture industry is missing. Competition is missing. Dominated by unscrupulous monopolists, few flower merchants end up buying most of the produce from the farmers at extremely low prices and distribute them to local retail outlets after a major mark-up. The retail florist shops usually operate on roadsides with little or no protection or air conditioning for flowers. Middle-class consumers are automatically excluded from this market due to sky-rocketing prices of the flowers. Under these circumstances, it is the responsibility of the state to invest in setting up functional and fair auction centres, as well as systematise floral shops with modern storage facilities to prolong the vase life of cut flowers. As far as production is concerned, the visible impediments to the development of this industry include dearth of essential seeds, flowers, germplasm and tissue culture facilities at affordable rates; deficiency of technological support; shortage of capital investment; scarcity of trained manpower; meagre post-harvest management; and a lack of pest and disease control. The constraints with marketing are the inadequate airfreight space; deficiency of sophisticated cold chain; absence of regional and international cooperation; patenting issues, royalties, the rigid WTO laws; and grossly inadequate transport facilities. Other hurdles include excess supply of flowers in the intercontinental market place, no guarantee of quality and quantity of products for upholdingadequate market share in export business. For this, the government should trim down import duty on all kinds of floral planting material and equipment; intervene to effectively bring down airfreight to a rational level; ensure sufficient cargo-space in airlines; create model nurseries with state of the art facilities for supplying authentic planting material and start florist organisations at a regional level on lines of a cooperative model.Setting up of training centres in at least two districts of each state for diploma course,making available cold chain facility from farm to final destination andat the same time ensuring phyto-sanitary conditions laid under the agreement of agriculture and other World Trade Organization laws can help the industry grow. The moment is now. 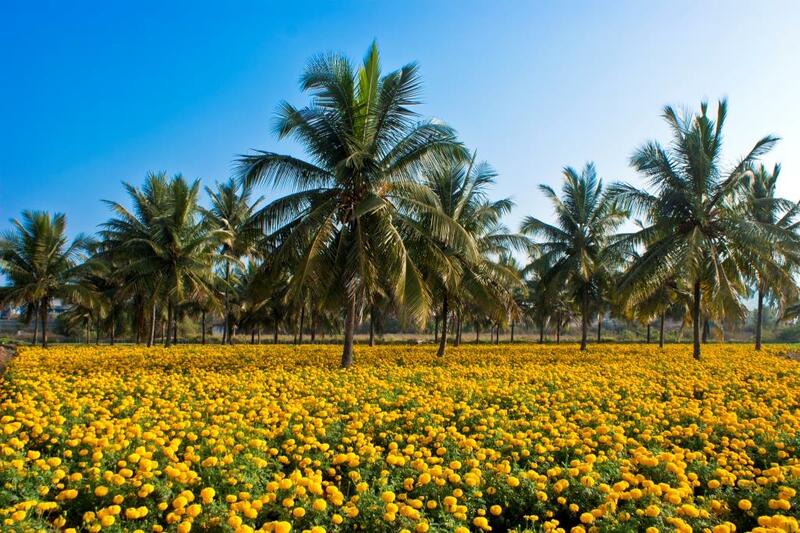 Will the country seize the opportunity to reap the benefits of floriculture? Only time will tell! The Phrase "Very Cheap labour" Could have been avoided... Let's promote dignity of our fellow citizens. The English meaning of the word Cheap may be different, but in Indian scenario, The word Cheap is very pejorative... Good authors like you working for sustainability of rural community, could indeed come up with alternate way to express the thought in a progressive way. Thanks for writing in! I understand the sentiment behind your message. Will be careful next time while choosing particular words/phrases. temple waste to human welfare. Thanks.